Throughout the summer Alison, Jaime, Erin, Elodie, and I will be hosting Twitter writing parties using the hashtag #RSWrite (feel free to kick-start your own too! ), giving away writerly care packages, and at the end of Ready. Set. Write!, we’ll be rewarding ourselves with what we’re calling “Manicures and Manuscripts.” Also, check out our RSW members’ list on Twitter. Stay tuned for more info! See you next week for our first update. Happy writing! Posted in: Goals, Ready. Set. Write! Good luck with your goals and I look forward to your updates (and quotes/tidbits, of course)! I’ve been thinking about doing some yoga and remember you posted a link on Twitter the other day. Will have to check it out! Thanks, Emma! We’re super excited too! So glad to have you back this summer! 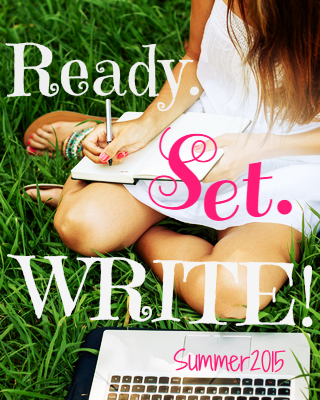 Can’t wait to hear about your WiP, and happy writing! I’m seeing a lot of 500 words a day goals. Seems like a manageable number, but one that’ll let us see progress, too. And yes! I’m so looking forward to taking my kiddo to the Museum of Natural History. I think she’ll love it, and I will as well! So glad you’re joining us this summer, Kaitlin! Good luck with drafting and exploring! There are TONS of awesome places to check out in DC. Yeah, the upper body stuff is hard! It’d be fun to see some definition in my arms, though. 🙂 Can’t wait to check out your goals, Jennifer! Thanks, Crystal! I’m so happy you’re joining us this summer. Best of luck this week! I hope you’ll be posting pictures of your D.C adventures. It’s such a great city, you are going to LOVE it there. Good luck with your goals and thanks for hosting! Oh, I’m sure I’ll post plenty of DC pictures. I’m sure you noticed that I’m sort of Instagram obsessed. 🙂 I’m so glad you’re joining us this summer, Alexa! Can’t wait to check out your goals! I grew up in Fairfax, VA (Woohoo NoVA!) and miss it a ton! I’m sure you’ll love it there! Good luck with all your goals! Thanks so much, Prerna! We’re looking forward to getting settled. 🙂 Have an awesome week! Yoga is fantastic. My little guy and I used to do yoga together. It’s very soothing. Great goals. I think I’ll go back and edit mine, adding in some non-writing goals. My daughter and I do yoga together sometimes, too. It’s fun to have a buddy. 🙂 Can’t wait to check out your goals! I love that one of your goals is to explore. It’s so much fun to discover new places, isn’t it? Good luck with all your goals! I once again don’t have specific word count goals, but just want to be done with one ongoing rewriting project (of an entire four-book prequel series) and be closer to finishing my alternative history, which I just went back to full-time on Friday and this time am going through in order. I’m so glad you’re joining us again, Carrie-Anne. Best of luck with your projects. I’m certain you’ll rock them! I’ve been slacking a bit with reading over the last couple of weeks, so I figured having an official goal would be helpful. Looking forward to writing with you this summer, Jaime! This is my first year participating! Thanks for hosting. Good luck with your goals. The DC area is awesome. One day my family might relocate there as well. I’m so happy you decided to join us, Kimberly! I think you’ll be happy you did. 🙂 I’ve met some awesome writers during Ready. Set. Write! in the past, and I’ve gotten TONS of drafting and revising accomplished. Can’t wait to check out your goals! Ha! That’s what I was thinking too, Erin. If it weren’t for accountability, I’m pretty sure my writing would completely fall away this summer. Hope you’re getting settled in your new place! Exploring – how fun! This is a well-rounded list of goals. Looks like you have a great summer ahead. Oh, it’d be so much fun to get together, Valerie! We’ll definitely have to make that happen. So glad you’re joining us for RSW this summer! Good luck with your goals! This is my first time participating, thanks for hosting this! I’m so happy you’re joining us, Suzanne! I think you’ll get tons done, and you’ll definitely meet some awesome people. Can’t wait to check out your goals for the summer! Awesome goals, Katy! I am so glad to have RSW in my life this summer. Needing to stay focused like mad. Will you tell us what 35 before 35 goal you are working on when you decide? I will! I’m definitely planning to start an herb garden once we’re settled in our new place, and I’d like to host a brunch, maybe for all of the writerly types who will be living nearby. 🙂 Of course, “sell a book” would be nice, too. 🙂 Looking forward to writing with you this summer, lady! Good luck with all the goals! I’m working on my own list of things to do before 30 and hope to cross some off too! Awesome, Eve! Best of luck with those Before 30 goals. I’ve been having so much fun with mine! This summer I plan to complete my WiP, which is the second novel in my series. I am also attempting to become more tech savvy this summer, as I don’t spend as much time with social networking as I probably should, and I find I frequently miss things. You may miss things from time to time, but you probably avoid wasting tons of time on social media, too, which is a GOOD thing! That said, it’d definitely be fun to chat via Twitter. Best of luck completing your WiP! A nice set of goals that don’t look to overwhelm (except perhaps the tourist/scouting visit to DC… that has the potential to eat days in joyous exploration)… Good luck on them. I don’t know if it helps, but some long time friends moved toward that way a while back because he had a job in DC. They ended up buying a house in Aberdeen, MD because of the cost (she wanted a few acres of land) and the convenience of the commute. It may sound silly… but a longer commute (via train) actually helps, because our friend sleeps to and from work enough to get some real rest. Oh, yeah, that’s smart! We were lucky to find a great house in Northern VA and the commute isn’t too terrible. We’re looking forward to getting to know the area. So glad you’re joining us for RSW, Eden! I love the variety in your goals! And I especially love the 30K in the new WiP. Just means I’m closer to reading another Katy story. 🙂 Good luck this week! Oh, you are too kind! ❤ Thrilled to be hosting with you again this summer, lady! Good luck on your goals and your upcoming move! Thanks, Alicia! I’m so happy you’re joining us for RSW this summer! Good luck with your goals! I hope the move goes well and you enjoy D.C. It’s one of my favorite places! So so excited to be writing with you this summer! Do we have a hashtag? Also–which 30 before 35 goals are you going for? Ha — yeah, we’ve had a hashtag change. #RSWrite is it for real. 🙂 For my Thirty Before 35, I’m planning to start an herb garden once we’re settled in our new place, and I’d like to host a brunch, maybe for all of the writerly types who will be living nearby. Of course, “sell a book” would be nice, too. 🙂 So looking forward to writing with you this summer, lady! Thanks so much, Courtney! I’m so happy you’re joining us this summer! I love you guys for hosting this every year. I failed on the blogging today, but I’m totally in on this. I’ll have so much revising to do this summer, so this is perfect timing. Next time you’re night writing, ping me! I miss our writing sessions. Yay! I’m so happy you’re joining us, Trace. More progress for the spreadsheet. 🙂 If you want to do a goals post, you’ve got all week to add your link to the list. No rush! And yeah, I would be the happiest person EVER if I could cross #2 of my Thirty Before 35 list. Crossing my fingers! My favorite thing I did in D.C. was the Library of Congress. I’m not sure how into that C will be, though, since it’s mostly a lot of really, really old books. The Smithsonians might be good, for her, though! They have Harry Potter’s Quidditch robes at the U.S. History one! And all of the First Lady dresses, which was my favorite exhibit. Good luck moving! Ah! I love that you did non-writing goals, and my favorite of those is exploring DC! Looking forward to hearing what you discover (especially since I might be visiting out there soon, eee!). Good luck, of course, with your writing goals too. Excited that you’re working on a new WIP! And thanks for hosting RSW again! Alice, if you visit DC, we must meet up! I’ll keep you posted on my favorite spots. 🙂 So happy you’re RSWing with us again this summer. Best of luck with your draft! Absolutely! I would love to see you! I will probably be there in the Fall to do tourist-y things, haha. Thanks so much for hosting! I just heard about RSW and am so excited to join this summer! I love your goals and am now so intrigued about your WIP… are you going to reveal category/genre etc, or is it in “top secret” mode? I’m so glad you’re joining us this summer, Carissa! I don’t talk too much about my WiPs — not because they’re top secret, but because I usually feel like I don’t know what the hell I’m doing. 🙂 The one I’m going to work on this summer is a YA contemporary-with-a-twist. I’m excited about it! Can’t wait to hear more about what you’re working on! I always love that you have personal goals mixed in with your writing goals. It’s so balanced! I’m surprised to see you’re moving to DC! Are you going to miss your warm beach weather? I am going to miss my warm beach weather SO MUCH! This DC move is all about my husband’s job. Definitely not my first choice, though the writing community there seems great. Silver lining. 🙂 I’m so glad you’re joining us for another summer of RSW, Karyne. Can’t wait to check out your goals! Your goals look awesome, Katy. I especially like the “get stronger” one – I should add that to mine! And the “explore” one looks like fun! Good luck with your move and good luck with your goals this week! I love the variety you have with your goals, little bit of everything. Good luck with writing your draft and all that yoga 😛 I love the idea of having ‘Explore’ be a goal, I definitely need to do more of that. I know it’s a little early, but here’s Week 5!